This post is sponsored by Elkay. All opinions are our own. My kitchen has been through many different phases. 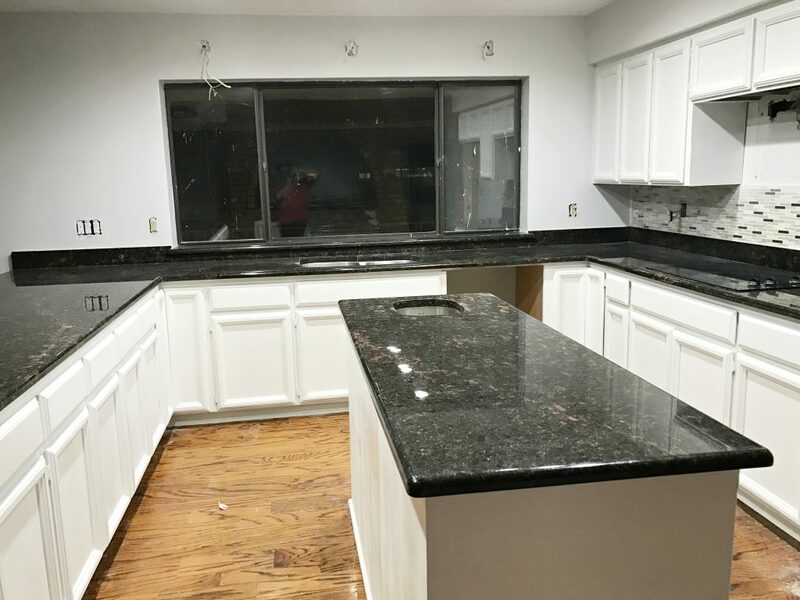 I want to take you through all the phases so far of our kitchen. Let’s start at the beginning. 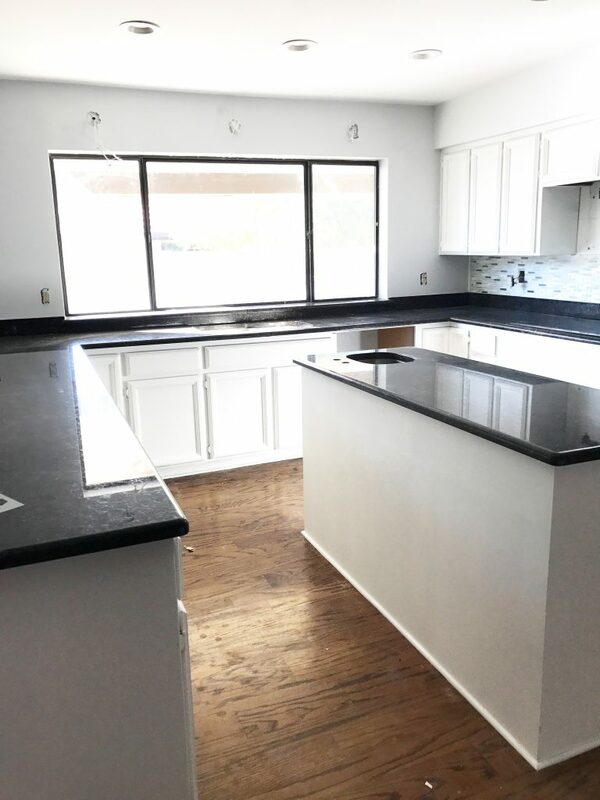 When we moved into the house the kitchen was dark and not the light and bright look I was wanting in a kitchen. The kitchen is such an important part of our home. It’s were our family starts and ends the day. 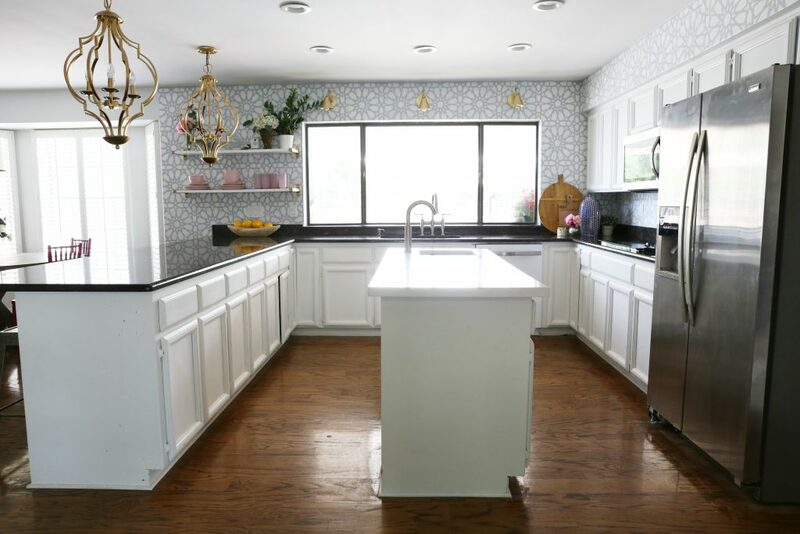 The cabinets were painted to make them look like they are cherry wood so the first thing I wanted to do was to paint the cabinets white. I got to work the week that we got the keys to the new house. 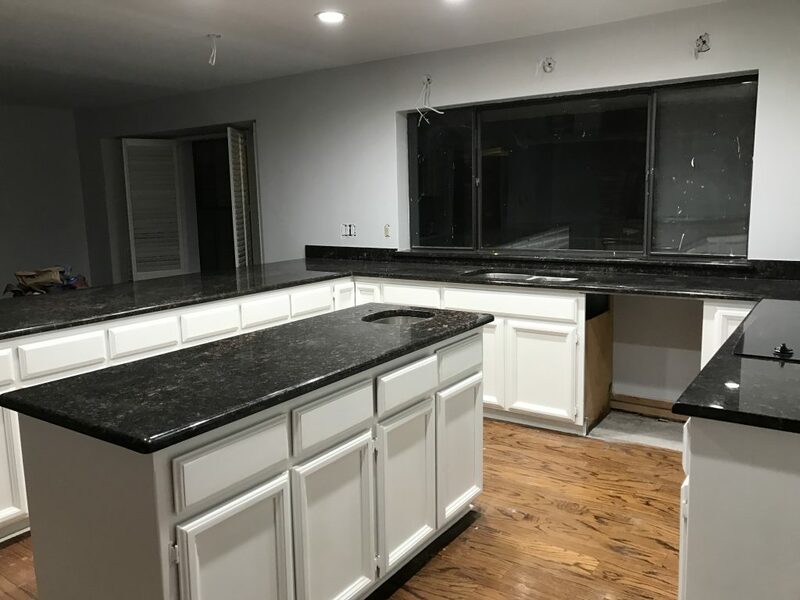 I wanted the cabinets to be painted and ready right when we moved in. The next step of making my kitchen more of what I wanted was a backsplash. The only problem with a backsplash is I could not choose one that I was ready to commit to. 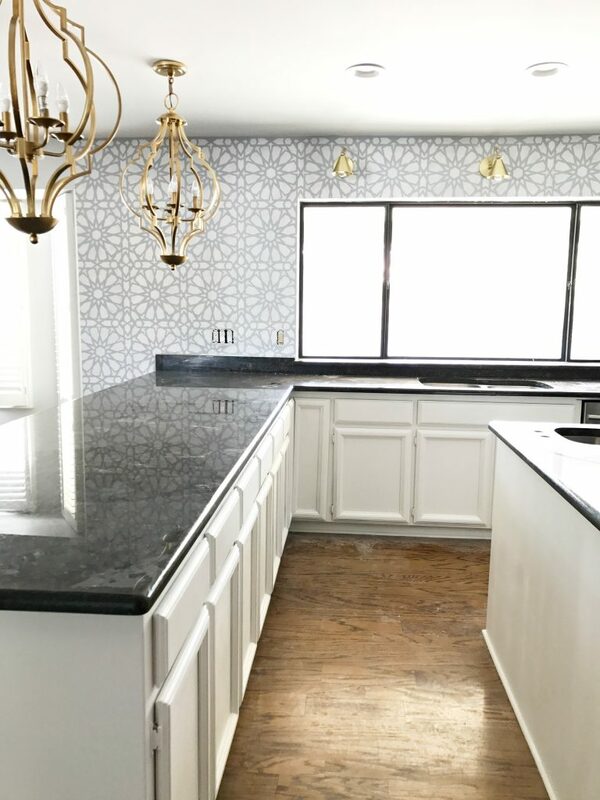 I found an image on Pinterest that I loved of an amazing backsplash but after searching high and low the only backsplash that I found like it was WAY out of the budget. I decided to use a stencil and DIY the backsplash. My kitchen was getting closer. 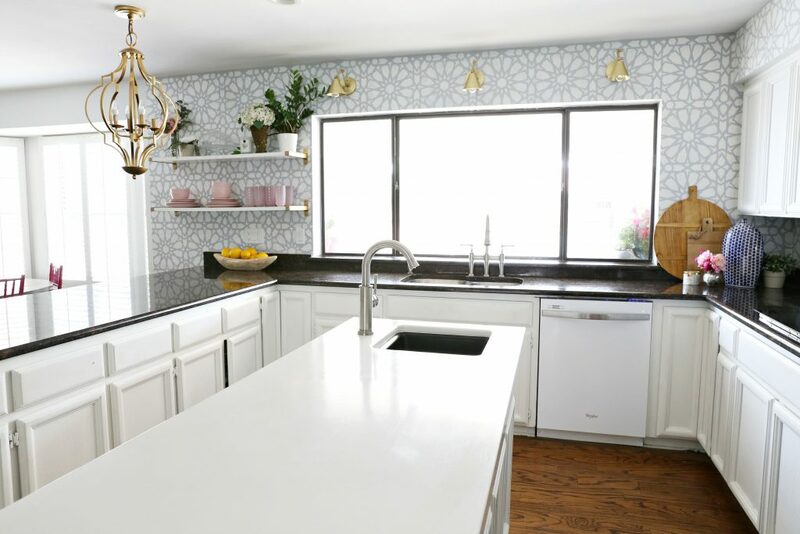 I have loved having a prep sink and a center island. My kids have gathered around the island and told me all about their day while I was preparing dinner. I do have two problems with the center island. 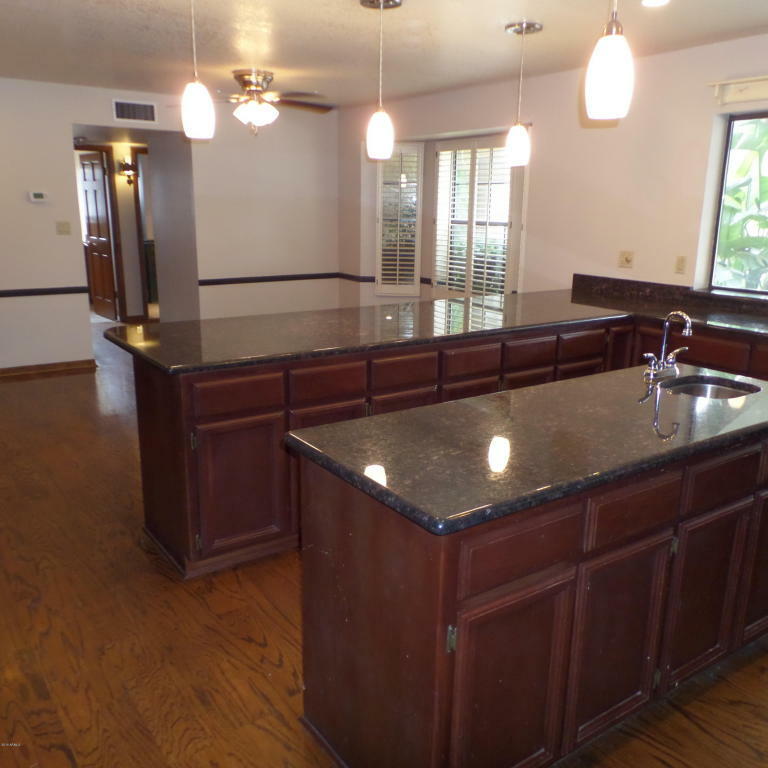 First, I feel like the dark countertop makes the island look small. Second problem is the prep sink is very small. At some point I would love to replace all the countertops but for now I wanted to replace the island countertop. Since I was going to replace the countertop now was a perfect time to replace the small prep sink and the faucet. I decided to do a white concrete countertop. I got my kitchen pendants from Overstock. The color was a bit more aged then I wanted so I spray painted them with Rustolum Metallic Gold Spray Paint. For the sink I fell in love with the Elkay Quartz Luxe Bar Sink and the Elkay Explore Single Hole Faucet. 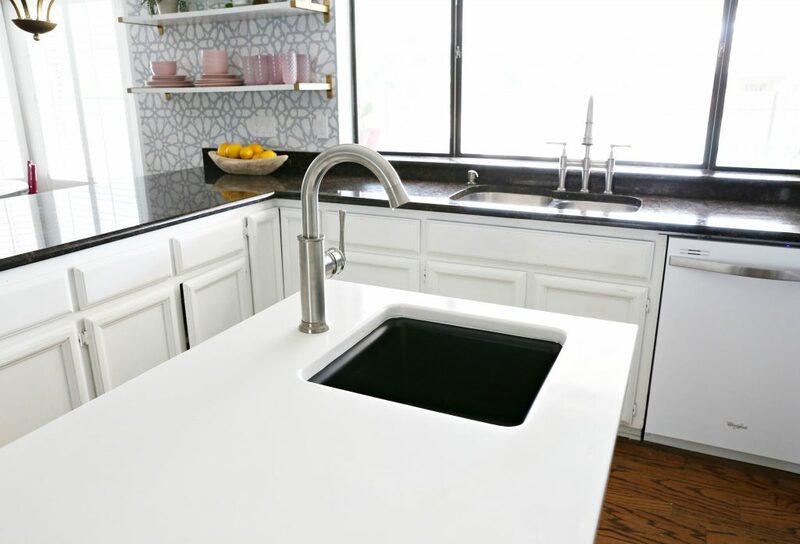 After we visited Elkay in Chicago I knew that the Elkay Quartz Luxe Bar Sink would be perfect for my center island. 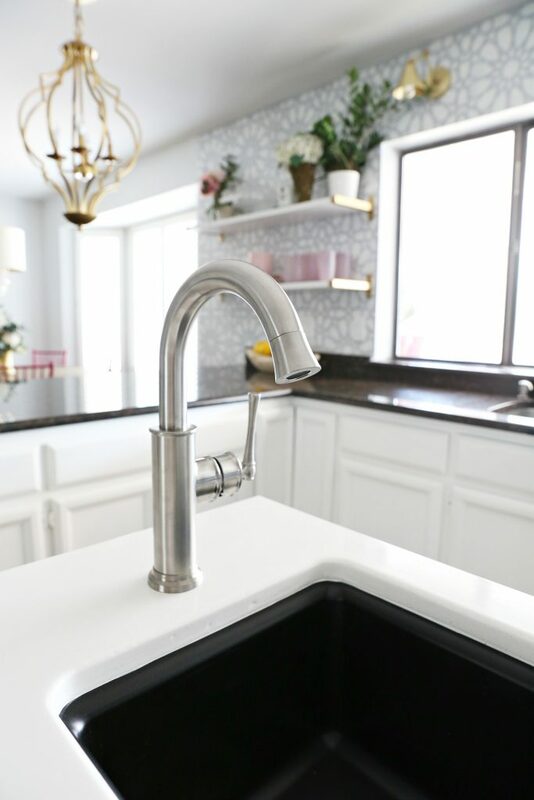 I loved the island faucet so much that I switched out my main faucet to this AMAZING Elkay Explore Three Hole Bridge Faucet. 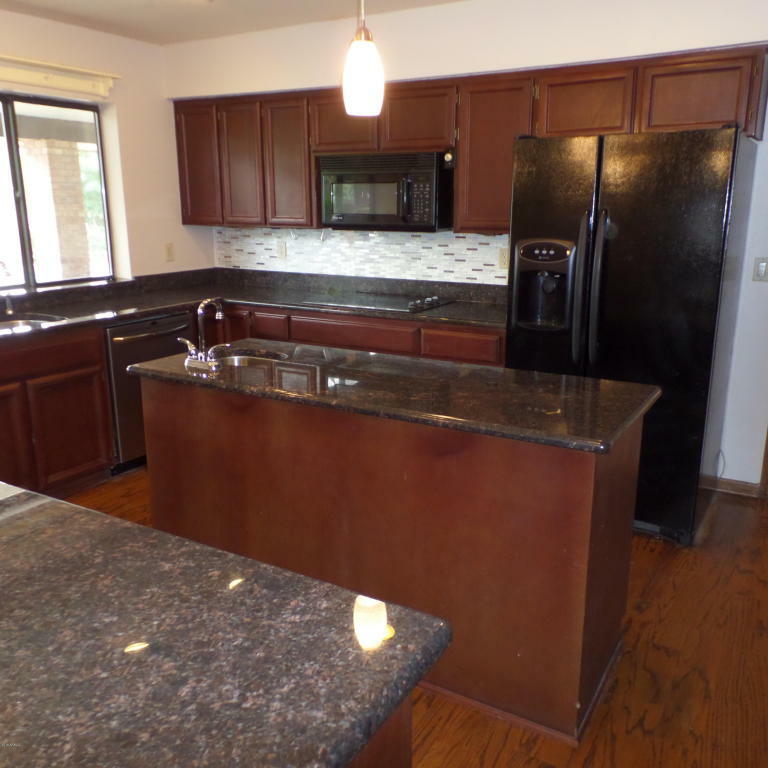 I have loved my kitchen ever since we put in my new sink and new faucet. 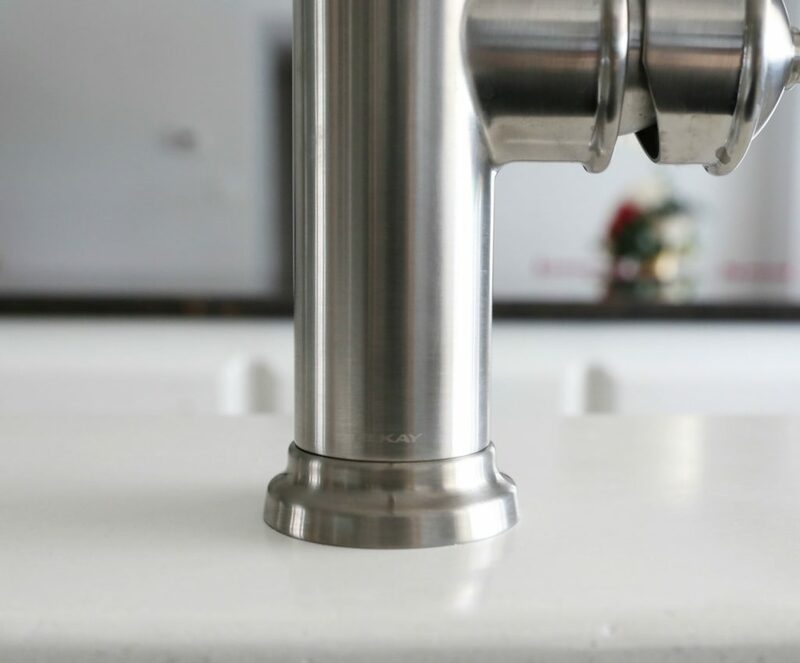 Check out Elkay for their amazing products and we can’t wait to share with you another kitchen update that we will be sharing really soon. 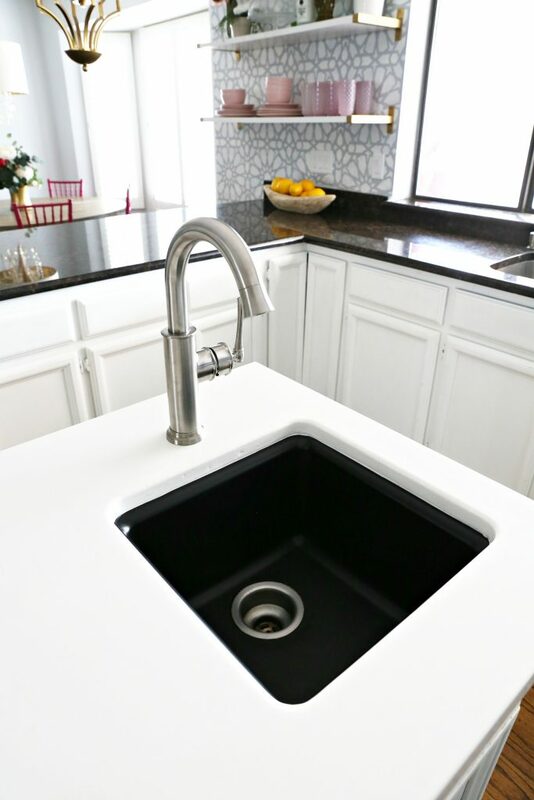 Check out this YouTube Video to show even more about this awesome sink! 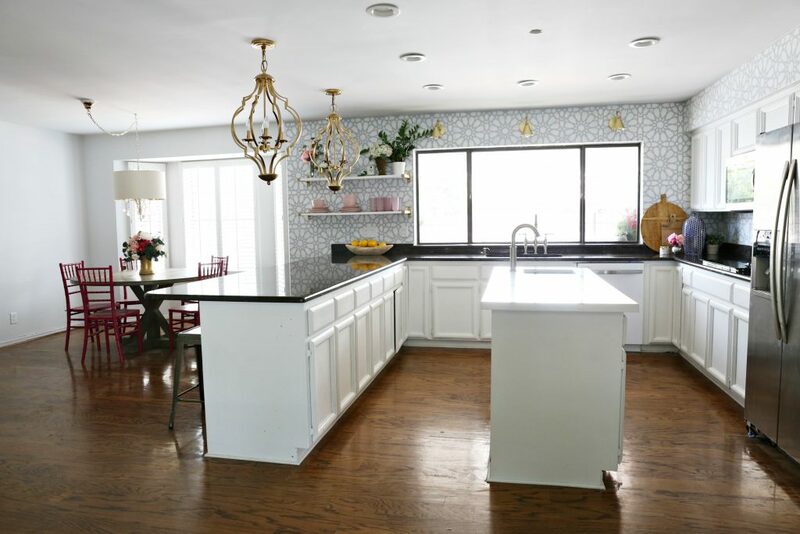 Where did you get your island pendants and lights above sink? 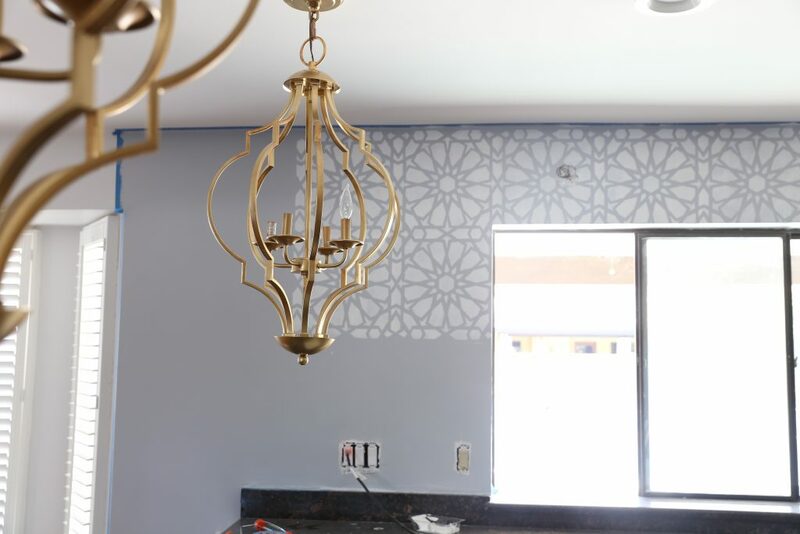 What stencil did you use for the backsplash? love the backsplash!!! 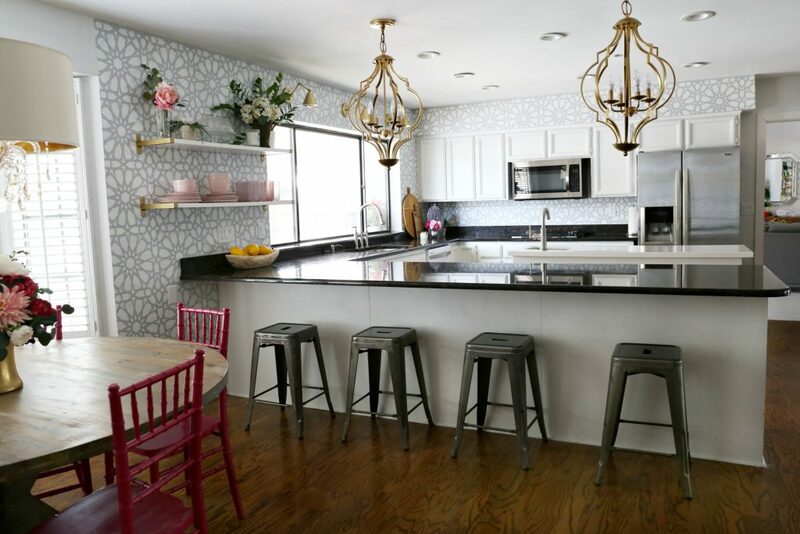 can you share more about your DIY stencil backsplash. is it like a wallpaper or a pattern tile? 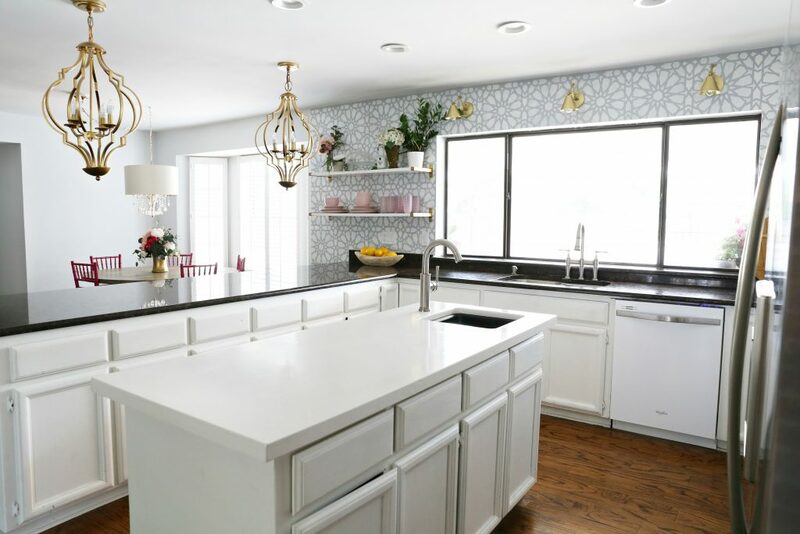 i have white cabinets in the kitchen too and looking for trendy backsplash options. Wonderful kitchen designs. I’m much inspired. I know this may be a silly question, but where is the oven? I can’t find it anywhere. Beautiful. Where is the stencil from?